A number of people were ejected from Government Buildings where they were staging a protest this afternoon. 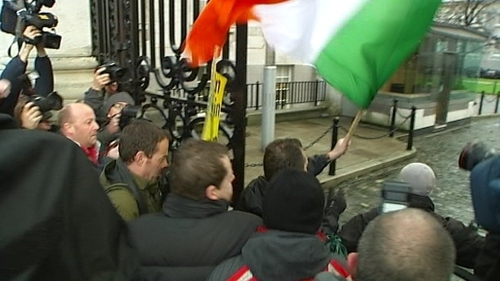 The group was mainly made up of Sinn Féin supporters, who had been protesting at Leinster House, but made their way around to Merrion Street. Gardaí pushed the protestors out of the grounds and the gates were closed. Sinn Féin TD Aengus Ó Snodaigh accused gardaí of being heavy-handed during the protest. Elsewhere, four members of Ógra Shinn Féin occupied the offices of Fianna Fáil councillors in Cork City Hall. The four, bearing flags and banners hanging out the windows said they were protesting at what they call Fianna Fáil's selling-off of Irish sovereignty. The protest lasted about 30 minutes. Earlier today they held a lunchtime protest outside the city's GPO with another protest planned for the city's national monument. Last night, a man was injured and taken to hospital following a scuffle outside Government Buildings. As ministers were being driven away, they were met by more than 50 protestors, some of whom shouted abuse and hit their cars with placards. During a scuffle, one man received a leg injury; he was first treated at the scene and later taken to hospital by ambulance.